At half past 6 in the evening, the inevitable crowds of young scene-makers have yet to invade Christy's on the Square in Santa Rosa (96 Old Courthouse Square; 707.528.8565). Though there are less than a dozen people in the place, Christy's is alive with a cacophony of sounds: ice shaken with a ch-ch-chattering snap, the tiny thunder of dice on the bar, lyrical fits of soprano laughter from a small group perched on a sofa nearby, the band's guitarists strumming chords in prep for their next set—and the recognizable voice of bar manager Jason Flint conducting an impromptu master class on tequila. A few moments later, he'll be conversing on the joys of the television show Wipeout ("Best TV show ever!" he says), and within the hour, he'll produce a long piece of ribbon and commence to dazzle the bar-sitters with a classic magic trick. Flint, as his many regulars will attest, is a master of the art of neighborly bar banter. From solemn attentiveness in times of sorrow to inspired silliness in moments of levity, Flint has a gift for gab that's earned him a reputation as one of the most entertaining bartenders in the North Bay. "Of all the things a bartender does on the job," testifies Flint, "from mixing drinks to handling money to bantering with customers, the banter is number one." After 10pm, Christy's tends to get too crowded for extended bartender conversation, but between 5 and 9, when the clientele is mainly working folks transitioning from their 9-to-5 shift, the vibe is loose enough that Flint can do what he loves best, which is making connections with people. As an 11-year veteran, Flint knows that good bar banter isn't just a fun way to pass the night behind the bar—it's also good business. "If you can't talk to people, if you can't socialize, then you don't get any repeat customers," he says. "Sometimes, a bartender has to approach a customer from a few different angles until he figures out how to engage them. But eventually, that's what builds a loyal clientele. The whole point of life is the friendships you make, the stories you tell, the fun you have. Good bar banter is all of that." Tom Wilson, daytime bartender for the Brasserie Restaurant at the Vineyard Creek Hyatt in Santa Rosa (170 Railroad St.; 707.636.7388), agrees. "A bar is just a building," he says. "And any monkey can be trained to mix drinks. But most people choose their favorite bar by its bartender, and they judge their bartenders by the quality of that bartender's banter." Wilson, in the business for over 30 years, spent much of that time in San Francisco, working everywhere from the Washington Square Grill to the legendary Speck's, where he once overheard a banter-challenged bartender ripping into a pair of customers for ordering two "gin and tonics" instead of the grammatically preferable "gins and tonic." To Wilson, the most artful bartenders are those who maintain a level of conversational grace, making their banter appear to flow effortlessly. "You just have to figure out how to start a conversation with different kinds of people," he says. "Most of my customers are tourists, so my conversations are often about where the person is from. It might begin with something as simple as my saying, 'You're from Arkansas? I've never been to Arkansas! What's Arkansas like?' And off we go. Or they make a comment about how perfect the weather is in California, and there's an opening for a good little conversation. A good bartender recognizes the opportunities for good conversation—and knows which conversations to avoid." And some conversations should be avoided. Most bartenders know to keep away from politics and religion, unless it's to agree politely and change the subject. But in an environment where people are consuming alcohol—often lots of it—a bartender's job is keeping the conversation friendly. "Sometimes good bar banter is just that: casual bar banter," says Laura Fontan, who works afternoons at John & Zeke's in Healdsburg (111 Plaza St.; 707.433.3735). "But sometimes it's all about redirecting the mood, staying positive, helping your customers find their silver lining." Fontan cut her teeth during the summer of 2004, working at her mother's working-class bar in Berkeley. "At my mom's place," she relays, "the banter was all sexual innuendo, all the time. So I developed this huge archive of really filthy jokes, because that's the kind of place that was. John & Zeke's isn't like that. There are definitely the customers who like a good dirty joke now and then, but the range of people is much bigger, so the banter isn't just one kind of thing." Still, for Fontan, it's all about displaying a good sense of humor. "What cuts across the spectrum, almost universally, is having a good, solid repertoire of jokes filed away on mental 3-by-5 cards," she reveals. "Jokes can always break the ice, they can cut tension, and they can defuse a situation. 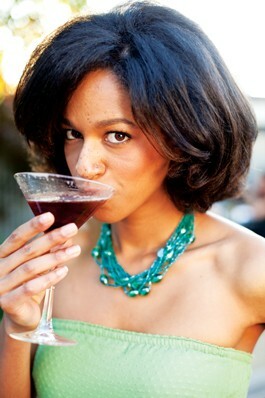 In general, a good bartender has a really healthy sense of humor—and usually a pretty thick skin." Of course, a bartender needs to know when a customer wants a joke, a conversation, a magic trick—or just a nice quiet drink. "It's all about reading people, and there is no formula to doing that because everyone is different," says Bill Woodbridge, owner of Pazzo's in Petaluma (132 Keller St.; 707.763.3333), a restaurant with a huge TV that's almost always playing offbeat classic movies, a subject Woodbridge can talk about with the best ("I speak fluent movie," he laughs). Having been in the business for over 30 years, Woodbridge has learned a lot of clever bar-banter tricks. One of them is an ability to transfer his end of the conversation to other patrons without them knowing it. "So," he explains, "if you're sitting at this end of the bar, you're talking about your cats, and there's some other guy sitting down the bar, and he says something about his dog, then I'm going to try and get the two of you talking—and then I go do something else. A big part of bar banter is the social experience, and that shouldn't just be between the patron and the person behind the bar." Another skill that separates the good bartenders from all the others is an ability to talk across generations or genders. "Most people don't know how to talk to someone 30 years older or 20 years younger," Woodbridge says. "Most men don't know how to talk to women. A good bartender can talk to anyone!" Woodbridge, as a matter of fact, once earned a fan base of women who prized his ability to identify jerks almost instantly. "When I worked in Marin, a lot of my customers were women who'd bring their new boyfriends in so I could judge them," he says. "A woman would say, 'Jane told me you did a really good job with her last boyfriend, who really did turn out to be a jerk!' So she'd bring in her boyfriend, we'd all talk for a while at the bar, then she'd go to the ladies room and I'd have a little conversation with the guy. And then when she'd come back, I'd give a little 'thumbs up, thumbs down' signal. "A good bartender," Woodbridge laughs, "knows when to banter—and when to just smile and nod."